Webster students in a biochemistry class. ST. LOUIS – Webster University was awarded more than $1 million in grants from the National Institutes of Health (NIH) and the National Science Foundation (NSF). The money will be used to support faculty research and to provide scholarships for students transferring to Webster in the Biological Sciences. Webster University is one of four institutions worldwide and one of only two in the United States to receive the NIH Biomedical/Biobehavioral Research Administration Development grant in this current round of funding. Webster also is one of only five colleges in Missouri to receive grants from both the NIH and NSF this year. This is the first time Webster University has received a grant from the NIH, while the grant from the NSF is the largest it has ever awarded the University. The NIH grant is a $449,000 award over five years to establish an Office of Research and Sponsored Projects that will support faculty research and build capacity to successfully compete for and administer additional research funding. Led by a multi-disciplinary of faculty and staff, the project will greatly expand coaching and professional development opportunities for faculty and initiate a review of current policies to incentivize research and the pursuit of external funding. 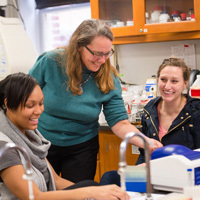 The NSF grant will provide $647,669 over five years to help recruit and retain community college students who transfer to Webster to complete degrees in the biological sciences. The money will be used to create scholarships, academic assistance programs for struggling students and career counseling for students who are about to graduate. The grant project will involve collaboration among Student Life, Career Planning and Development, Advising, Admissions Financial Aid and Alumni programs. The Interdisciplinary Science Building currently is scheduled to open in fall of 2017. When open, it will provide students and faculty the opportunity to study in high-tech learning laboratories and participate in cross-discipline collaborative research projects. Required NIH Disclaimer: The Eunice Kennedy Shriver Institute Of Child Health and Human Development of the National Institutes of Health will be funding this program to build research capacity, the content of any research emerging from this program is the sole responsibility of the authors and does not necessarily reflect the official views of the National Institutes of Health.